Thai Herbal Compress involves massaging the body with herbs tied in a muslin cloth and steamed to heat them and release their healing properties. The herbs used (kassumunar, kaffir lime, lemongrass and camphor among others) sooth muscle pain and stiffness, nourish the skin and are anti-inflammatory. They also smell wonderful! The heat penetrates into the tissues, giving a deeply relaxing yet very gentle massage. the hot compresses are ideal for alleviating pain, stiff, sore or pulled muscles and ligaments, chronic back aches, arthritis, even skin conditions, migraines and chronic stress or anxiety. The blend of traditional Thai herbs used in these compresses has a relaxing and invigorating effect on the body and mind, soothing sore and overworked muscles while giving the body’s energy reserves a huge boost. 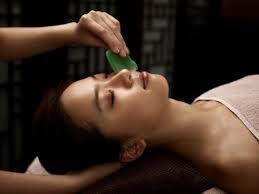 Thai Herbal Compress can also be combined with Thai Massage. This heated muslin parcel of aromatic coconut is a heavenly treatment which moisturizes and has a terrific aroma. It commonly compliments traditional massage. This type of treatment is said to be particularly good for muscle aches and pain. These compresses contain coconuts which have been used in medicine for centuries. Coconut supports the natural chemical balance of the skin it is an excellent moisturizer and skin softener which helps to relieve dryness and flaking. Coconut helps prevent wrinkles, sagging skin and age spots, it promotes healthy complexion and provides protection from the damaging effects of UV radiation from the sun. Coconut forms a barrier on the skin to ward off infection and stimulates anti-microbial activity.Traditional Thai Herbal Compresses filled with organic coconut are soaked and heated and applied to the body in this 90 minute session. This technique releases the coconut oils which, when applied warm, penetrate the skin due to their small molecular structure to provide an amazing list of benefits. It absorbs easily and leaves no greasy feeling. It is one of the strongest antioxidants used to fight free radicals that attack the skin and connective tissue, causing sagging and wrinkles. The warm coconut compresses massage the muscles while the coconut oil softens dry skin by removing dead cells which stimulates new skin cell growth. Thai Foot Massage is a massage of the lower legs and feet that involves hands on stretching and massage to “open” Sen (energy) Lines, along with the use of a stick to stimulate the reflex points on the feet which correspond to the internal organs of the body. Thai Foot Massage stimulates these points to promote general health and well-being. Traditional Thai Massage and Thai Foot Massage compliment each other beautifully. Thai Massage balances the elements of the mind and body, while Thai Foot Massage stimulates the internal organs, giving the receiver an holistic treatment. Hot Rock/Stones Massage is the application of warmed volcanic basalt stones, combined with manual massage will provide the client with a deeply relaxing and therapeutic experience. The heat of the stones helps muscles release more quickly than in traditional massage. Hot rock/stone massage is suited to people who tend to feel chilly or who have cold feet. It’s also suited for people who have muscle tension but prefer a lighter massage. The heat relaxes muscles, allowing the therapist to work the muscles without using deep pressure. This new revolutionary treatment from the Tropics uses 100% genuine recycled Tiger Striped Clam Shells from the South Pacific. The shells are heated by LavaGel – an innovative blend of natural minerals and ingredients including algae and dried sea kelp that, when blended with salt water, generates its own heat. The indulgent and truly pampering Lava Shells Relax Body Massage offers an idyllic treatment combining the warmth of the shells, using a blend of mango and green tea oil with deep tissue massage techniques to create a sense of balance to the entire body and mind. During the massage, the shells are worked over the palms, arms, feet and legs in slow deep moves to warm and de-stress followed by wonderfully tranquil massage on the back, neck and shoulder area to ease away all tension, knots and stress. The specialised deep tissue massage techniques target trigger points in muscles which are responsible for tension and referred pain. Your treatment will be tailored to suit your individual needs and leave you feeling invigorated, muscles will be relaxed and aches and pains will be significantly reduced. Choose a 60 or 90 minute treatment for an unforgettable and sublime experience. Do you like scented massage oils and aromatherapy candles that are environmentally friendly and all natural? If so then our fabulous body massage candles are just for you. For an innovative and unique head to toe luxury Spa treatment, there is nothing quite like the Orli Massage Candle.Orli Massage body candles are handmade in Scotland using superior skin nourishing ingredients such as rich shea and cocoa butters, jojoba and sweet almond oil with vitamin E, avocado butter, passionflower seed oil, hawaiian kukui nut oil and Moroccan Argan Oil. All are scented with high quality fragrance or essential oils for fabulous aromas. The ingredients are not only natural, but they are extremely rich and moisturizing, have a number of benefits for your skin and, with a low melt point the oils will not burn you. Massage is a great way to relieve the physical discomfort & emotional stress that can accompany pregnancy. It relaxes the mind & body, relieving muscular tension, promotes wellbeing and improves sleep at night. Massage can help after birth as well too. As well as giving you some precious time to look after yourself, it promotes muscle healing and spinal alignment, important factors in returning your body to its pre-pregnancy state! Local circulation is increased therefore softening and plumping the skin and leaving a healthy glow. This treatment will be incorporated with a relaxing facial for the ultimate effect.